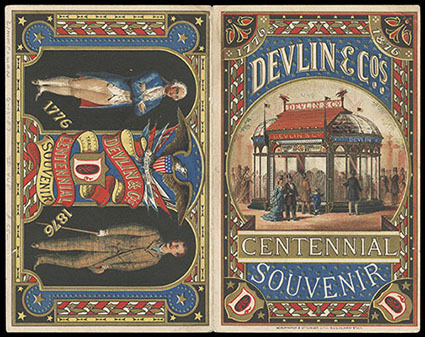 1876 Centennial Exhibition Cards, six different lithographed cards mostly multicolored; four advertising including a spectacular Devlin & Co. (Clothing House) fold out card, one from the Pennsylvania Railroad with arrival, departure and fare table on reverse, Very Fine. 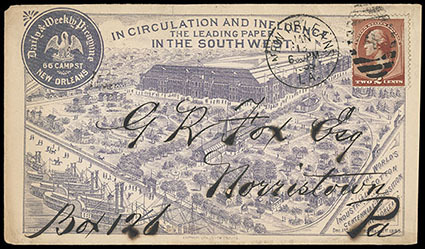 1884 World's Industrial and Cotton Centennial Exposition, allover illustrated design in purple for the" "Daily & Weekly Picayune"" showing a Bird's Eye View of the Exposition Grounds, franked with 2¢ Bank Note tied by New Orleans duplex cancel, mended cover tear at top, Very Fine, a spectacular & rare design. Scott No. 210 Estimate $200 - 300. 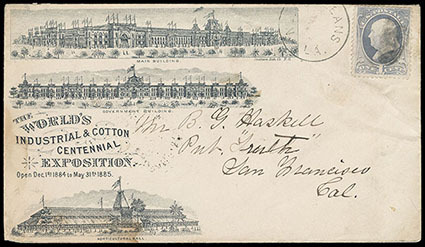 1884 World's Industrial and Cotton Centennial Exposition, wonderful illustrated cover showing the Main & Government Buildings & the Horticultural Hall, franked with 1¢ Bank Note canceled by cork with New Orleans cds alongside, reverse with all over descriptive text of the Expo; light stain at lower right, still Very Fine. Scott No. 206 Estimate $150 - 200. 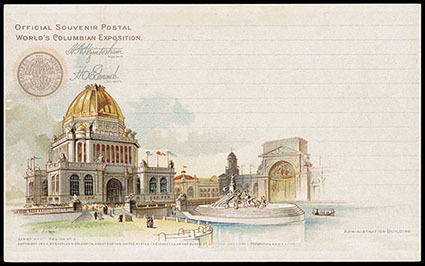 1893 Columbian Exposition - World's Fair Sta. Chicago, Ill., Rec'd Aug 18 '93, receiving cds on reverse of legal-size Post Office Department "Inquiry Office" Chicago Ill. preprinted envelope to Chief General German Art Association, Worlds Fair, Chicago Ill., two strikes of "Chicago, Ill Aug 18" duplex; vertical file fold at center, Fine and very rare proper use of receiving cds. 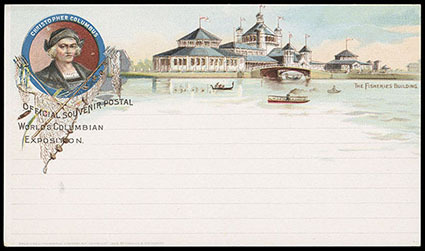 1893 Columbian Exposition - Administration, Agricultural and Horticultural Buildings, 1¢ Exposition Set 11 postal card, cancelled by "World's Fair Sta., Chicago Ill., Jul 19, 1893" duplex to Catskill N.Y., receiving datestamp; some slight soiling and expertly repaired at bottom, otherwise F.-V.F., exceedingly rare especially in used condition. Scott No. UX10. USPCC No. EX80 Estimate $500 - 750. 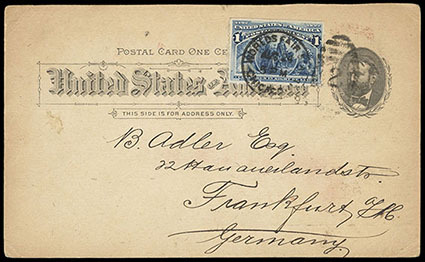 1893 Columbian Exposition - Machinery Building, 1¢ Exposition Set 10 postal card, uprated with 1¢ Columbian and cancelled by "World's Fair Sta., Chicago Ill., Aug 24, 1893" duplex to Frankfurt, Germany, New York transit backstamp; some slight toning and some edge wear, otherwise Very Fine, the earliest reported usage of this card and an extremely rare Exposition cancel card to a foreign destination. USPCC No. EX78. Scott No. UX10 Estimate $400 - 600. 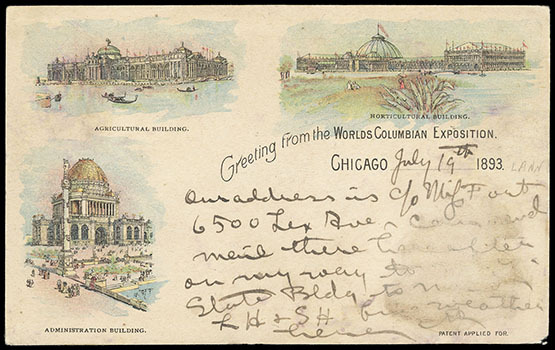 1893 Columbian Exposition - Set No. 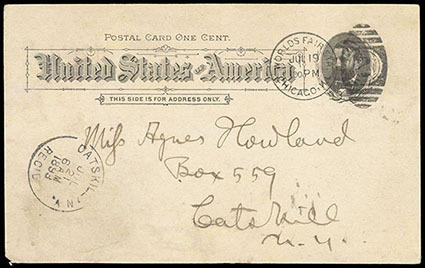 9, complete set of 2 multicolor mint 1¢ postal cards, Extremely Fine, rarely found in this condition. Scott No. UX10. USPCC No. EX76-EX77 Estimate $200 - 300. 1893 Columbian Exposition - Goldsmith Set No. 1, complete set of 4 multicolor mint 1¢ postal cards, Extremely Fine and choice, a lovely mint set. Scott No. UX10. USPCC No. EX11-EX14 Estimate $250 - 350. 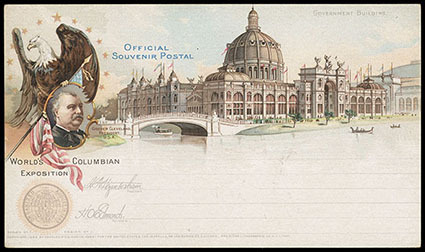 1893 Columbian Exposition - Goldsmith Set No. 2, complete set of 10 multicolor mint 1¢ postal cards, with original wrapper, Very Fine and choice, scarce set with the wrapper. Scott No. UX10. USPCC No. EX15-EX24, EX24Wc Estimate $150 - 200. 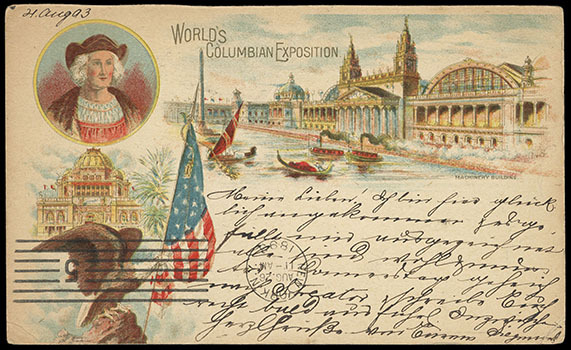 1893 Columbian Exposition - Goldsmith Set No. 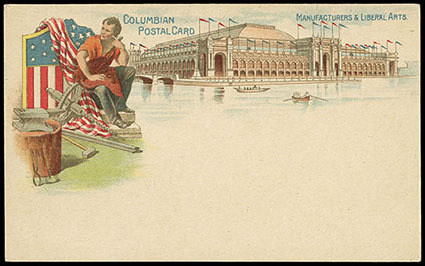 4, complete set of 10 multicolor mint 1¢ postal cards, each uprated with 1¢ Columbian under indicia; some trivial faint edge tone on reverse of one card, Very Fine and choice, very scarce as this set was only available during the last week of the fair. Scott No. UX10. USPCC No. EX35-EX44 Estimate $400 - 600.